American Meteorological Society, Coleman, et. al. If you have read Warnings, you have read the chapter, "The Day TV Weather Grew Up," when I discuss WKY TV's storm coverage of the Oklahoma City tornado of June 8, 1974. Based on the research I did as I was writing the book, I state it was the first time a tornado was broadcast live. There is a article in the May, 2011, Bulletin of the American Meteorological Society that states the first live broadcast was April 3, 1964 from station KAUZ TV in Wichita Falls, TX and cites a YouTube video (below) as evidence. The image at the top of this posting comes from article which, in turn, came from the YouTube video. The outdoor coverage begins at 1:27 into the tape. It shows a rotating wall cloud* and what is described as "dust and smoke" (that does not seem to rotate) under the wall cloud. At 4:28 into the tape, the weathercaster explictly says he has not seen a tornado and says what he is seeing is "cloud turbulence." My viewing of the tape does not reveal a visible tornado but there may have been one present. The weathercaster, during the broadcast, mentions that KAUZ was the first to put a tornado on the air in 1959 but, based on my research, that was a hook echo (the radar signature of a tornado) rather than actual live images of the tornado itself. So, who did the first live broadcast of a tornado? It may have been KAUZ as indicated in the article (without the weathercaster realizing) or it may have been my broadcast in 1974 when I clearly identified to the viewers (during the live broadcast) they were seeing a "funnel cloud, and possibly a tornado." As it turned out, we were broadcasting a tornado doing damage but the haze that afternoon prevented seeing the funnel all the way to the ground. Regardless of which was first, I wanted to make Warnings readers aware of this earlier telecast and its significance. * A "wall cloud" is a slowly-rotating cloud that extends downward from the primary base of the thunderstorm. It is often a precursor of a tornado. Below is a wall cloud (outlined in red) and a funnel cloud (arrow) that I photographed in north Wichita in June. I wrote about it here. I converted this image to black and white so it could be compared to the Wichita Falls video. 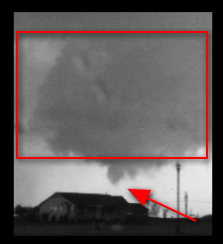 Like the wall cloud in the Wichita Falls video, there was dust under the wall cloud from time to time, but not the organized, fast-rotation associated with a tornado. The above is incorrect. It was brought to my attention (and I thought I had corrected it everywhere) that the version of the tape that I had was incomplete. There is a longer version that clearly shows the tornado. I appreciate reader "I Was There" (who's comment did not come through) for pointing out this posting had not been corrected. Mr. There, you may email me at: mike.smith@accuweather.com if you would like to tell more of the story. I'm sure it is fascinating and I would love to post it. Thank you.